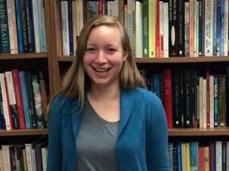 The Women’s Alliance for Theology, Ethics, and Ritual (WATER) congratulates Staff Associate, Elizabeth Hardt for receiving the price for best undergraduate paper at the Southeastern Commission for the Study of Religion (SECSOR) this past weekend in Atlanta, GA, as part of the Regional Meeting of the America Academy of Religion. Elizabeth’s paper, entitled “‘ISIS Brides’: Western Neo-Orientalist Narratives of Female Terrorism,” was written during her senior year at Transylvania University for her Gender Roles in Religious Life class. She is now part of the Loretto Volunteer Program assigned to WATER for 2015-2016. We are very proud of Elizabeth’s accomplishment and delighted to celebrate her success.